Bill Baggs Cape Florida State Park is on the southern tip of Key Biscayne and is only a few minutes drive from downtown Miami. The park is named for the former editor of The Miami News. The Cape Florida lighthouse on the ocean side of the park was rebuilt in 1846 from the ruins of the original one that was constructed in 1825. The original lighthouse was the scene of bloody battles between the early settlers here and the Seminole Indians. 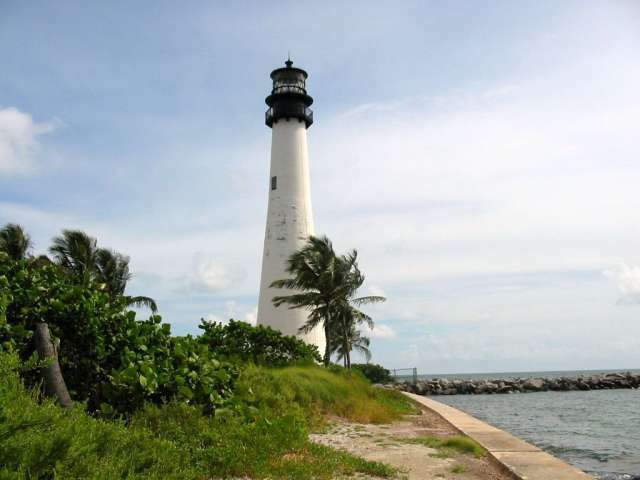 The lighthouse is the oldest building in Miami-Dade County. The park staff gives tours of the lighthouse and the light keeper's cottage on Thursday, Friday, Saturday and Sunday. There is a beautiful natural harbor on the Biscayne Bay side of the park that is named No Name Harbor. It is a favorite party spot for locals and a great layover for cruising sailors waiting for calm Gulf Stream waters before crossing to the Bahamas. Locals also like to stay on their boats overnight in the harbor. 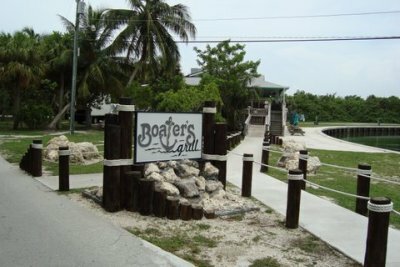 A restaurant, Boater's Grill, overlooks No Name Harbor and serves good seafood and other dishes prepared with authentic Cuban recipes. Another restaurant, Lighthouse Cafe, is closer to the lighthouse and beach and serves a more limited menu. The beach on the ocean side of the park is one of the nicest in Florida. It is more than one mile long with soft white sand and great clean water for swimming. Other things to do in the park include renting bikes or putting your kayak into either the Atlantic surf or Biscayne Bay. There is also pretty good fishing along the shoreline on Biscayne Bay. The park has picnic facilities and restrooms. There are no campsites in the park, but primitive camping experiences can be arranged for kids through the park service. It is a treasure to have a beautiful quiet park like this so close to the hustle bustle of urban downtown Miami.